You can now order Disney’s Infinity which, if you haven’t heard of it yet, is pretty much Disney’s answer to Skylanders. It’s a multi-platform game that comes with interchangeable Disney figures that come to life on the game. Check out the list of retailers you can pre-order Disney Infinity on. 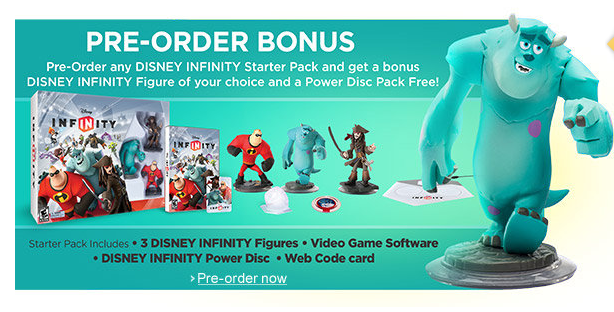 I like the Disney Infinity deal on Amazon, where you can pre-order the starter pack and choose an additional character as a bonus with your pre-order purchase. The game requires a Starter Pack which includes the INFINITY base, figures and play sets for Monsters University, Pirates of the Caribbean and The Incredibles.